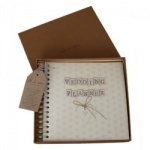 The East of India Range of Wedding gifts is perfect for the Shabby Chic styled home of the Newlyweds! With a fantastic selection of wedding themed gifts including Wedding Keepsake Boxes, Marriage Certificate Holders, Wedding Photo albums, framed phrase pictures, guest books, bunting gift tags, word blocks and more! So if you're looking for something a little bit different for the new Mr & Mrs then look no further than the East of India Wedding Range!